Browser strategy in real time, most focused on the development of the castle, the creation of infrastructure, expansion of territory, improving the quality of life of citizens. In order to proceed with this game - you need to register by filling out the login, password and e-mail on the website of the game (you can get it by clicking on the button to play a Game Review Legends of Honor). And to play without registration - click on the login button through one of the available social networks. Made in the old style, so would like you're in a historical film, the game will give you into the lock management. It is located in the woods, surrounded by mountains on one side and the lake on the other. The picture on the screen can be moved and to consider the nearby area. With the passage of time in the game Legends of Honor, you will observe the change of seasons in this area. Available area around the kingdom would allow to grow your castle to epic proportions. After a brief training, you will be prompted to select a fraction, for which you will play the Legends of Honor. There are 3 options: Order of the Golden Claws, The Knights of ash and of gloom and Warriors wild lands. Main Game time will be spent on development, the battle is devoted minimal attention, even more so that they take place in the automatic mode. 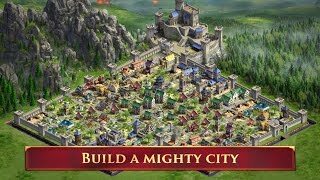 Types of buildings in the game Legends of Honor: manufacturing (serve as a source of resources), civil (civilians to stay), military (barracks for the troops) and building - decoration (need for a good mood of the townspeople). In addition to construction - will have to deal with increased levels of certain buildings. And when all allotted for new construction area will be exhausted - use the option extensions - it will increase the castle borders. Progress in the online game Legends of Honor is very slow - it will have to spend a lot of time, and the long wait for this or that building will produce resources. Provided is another way of stone and wood production - in order to use it you have to pick up a pickaxe and go in person to knock on a stone rock. It is also possible to accelerate with the help of gems that are bought for real money. The rest of the resources of the game: the food (it is grown, farmers), coins (come in the form of taxes), the level of happiness of people (directly affects the efficiency of their work). While the expected progress of the castle, your hero - knight can go to explore other areas, and there - to fight the enemies. 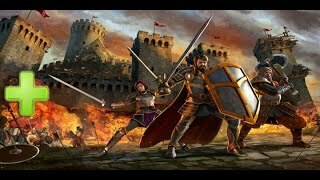 Battle - this is a good way to take possession of the necessary resources now, rather than waiting until your kingdom will produce them itself. However, a full-fledged military battles here will not show: the battle looks like a meeting between the two figures on the map, the result of which will be awarded points, and incurred losses. For different purposes, you can buy units: among them are mercenaries (that soldiers - swordsmen, archers, cavalry, and others), and business executives (engaged in the extraction and production resources), and the need to pump both. The basic fighting skills: health, defense, attack, trophies. Apart from these, there are a number of bonuses, offering advantages in battle. Bonuses are available for all types of troops.